SHANGHAI, April 19, 2017 /PRNewswire/ -- Adient plc (NYSE: ADNT), the world's leading global automotive seating supplier, displays its new Integrated Luxury Seat at Auto Shanghai 2017. This "Captain" seat, independently innovated, designed and engineered by one of Adient's joint ventures in China – Yanfeng Adient Seating Co., Ltd. (YFAS) – excels in comfort and sets the "China Luxury" trend for automotive seating. "Adient leverages consumer data from our own trend research to explore the habits, needs and desires of drivers and passengers. These insights, along with the inspiration we draw from outside the automotive seating market, help inform our future initiatives," said Richard Chung, Adient's vice president of global innovation. "The Integrated Luxury Seat combines contemporary features and functions, and offers a luxurious look and feel to high-end passengers. It addresses the Chinese consumers' priority to have a comfort rear seat in the car and to enjoy the first-class riding experience," said Chung. Easy operation: The 12-way power and 2-way manual adjustable seat is mounted on a long track, and can be sliding with "flash" or "low" speed mode for easy-entry function or adjustment of normal sitting positions. The seat with memory functions can be reset to the default position by a one-touch button. Enhanced flexibility: Electromechanical release handle allows easy-exit from the car for rear seat passenger. The front seats can be released and pushed forward by hand to create enough room to pass. Healthcare: Air-purifier and PM2.5 detector installed in the seat back provides the passengers with a high level of protection. Customized comfort: Continuous air bladders integrated in the seat cushion enable a personalized hardness scheme for the seat to meet different comfort requirements from passengers. 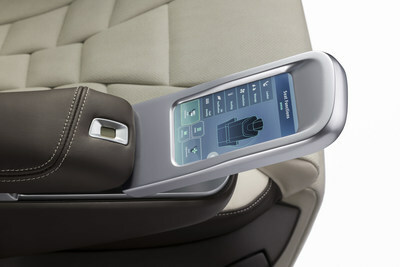 Intuitive human-machine interaction (HMI): LCD screen integrated in the rear seat armrest can be used to wirelessly control major seating functions. Superior luxury: The seat backrest can be deeply reclined up to 170 degrees. 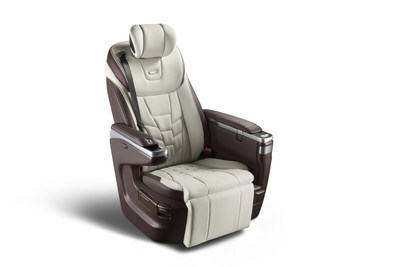 It offers maximum comfort and convenience with many state-of-the-art features such as a 4-way sleeping head restraint with sliding wings, stand-alone armrest, cup holder, table tray, integrated iPad holder, 220V power outlet, USB port, phone charging holder, ventilation, heating, cooling, massaging, lumbar support and 4-way power leg rest. The Integrated Luxury Seat design is based on a modular concept and also is applicable for multiple car segments such as MPV, SUV and commercial vehicles. As part of Adient's global innovation network, YFAS has built up all the necessary in-house research and development capabilities for automotive seating products, such as consumer and trend research, industrial design, craftsmanship, benchmarking, advanced engineering, product and technology development, prototype and testing. Its technical center employs about 500 engineers with an average professional experience of eight years. The Integrated Luxury Seat showcased in Adient's exhibit in Booth 5BA001, Hall 5.2, National Exhibition and Convention Center (Shanghai) will be open to media and invited guests April 19-20 and to the public through April 28.